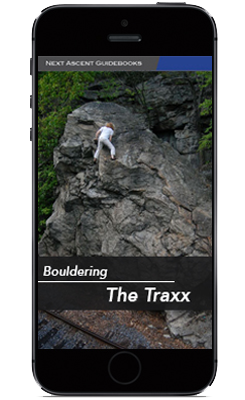 The Traxx Bouldering Guide is a compilation of all the problems and routes at this area in NEPA. This guidebook highlights all the problems and includes GPS, real-time maps, topos for every route, photos for every route, detailed route descriptions, history, and much much more. This digital guidebook is now available. Simply download the app in the iTunes store and the guidebook is available as an in-app purchase. Email us to stay informed about updates, free apps, and other guidebook apps for the area and across the U.S. that we will be adding soon. Our app includes GPS, real-time maps, directions to all the areas at this area, route descriptions, history, ratings, and more. This app is available for iPhone. We will have an Android version soon. If you don’t have an iPhone and would like a guide anyway, please email us.